Get involved in a new citizen science project at CycloneCenter.org. 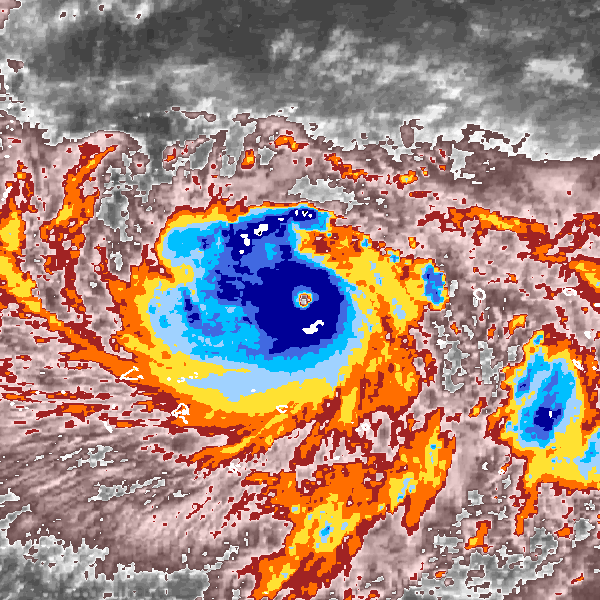 The poor quality of the tropical cyclone (TC) data record provides severe constraints on the ability of climate scientists to: a) determine to what degree TCs have responded to shifts in climate, b) evaluate theories on how TCs will respond to climate change in the future. The root cause for the poor data is the severity of the TC conditions (e.g. high wind, rough seas) and the remoteness of these storms – the vast majority of which form and remain well away from most observing networks. Thus, most TCs are not observed directly and those that are (with buoys, aircraft reconnaissance, ships) are often not sampled sufficiently (see the IBTrACS, (Knapp et al., 2010)). This leaves tropical cyclone forecasters, who are ultimately responsible for recording TC tracks and intensities (i.e. maximum wind speeds), with a challenging problem. Fortunately, there is a tool called the Dvorak Technique which allows forecasters to make a reasonable determination of the TC intensity by simply analyzing a single infrared or visible satellite image, which is almost always available Velden et al., 2006). The technique calls for the analyst to determine the center location of the system, the cloud pattern type, the degree of organization of the pattern, and the intensity trend. A maximum surface wind speed is determined after the application of a number of rules and constraints. The Dvorak Technique has been used for many years at all global tropical cyclone forecast centers and has been shown in many cases to yield a good estimate of maximum TC wind speed, when applied properly (Knaff et al., 2010). However, there is a level of analyst subjectivity inherent in the procedure; the cloud patterns are not always clear, it is sometimes difficult to accurately determine the storm center and the rules and constraints have been interpreted and applied differently across agencies. This introduces heterogeneity in the global TC record since the Dvorak Technique is usually the only available tool for assessing the maximum wind speed. There has been recent work to eliminate the human element in the Dvorak Technique by automating the procedure. The Advanced Dvorak Technique (ADT) uses objective storm center and cloud pattern schemes to remove the subjectivity (Olander and Velden, 2007). All other classification rules and constraints are then applied and combined with additional statistical information to produce automated intensity estimates. Although the ADT skill is comparable to experienced human Dvorak analysts, large errors can occur if the scene type is not identified properly. A new crowd sourcing project, called Cyclone Center, embraces the human element by enabling the public to perform a simplified version of the Dvorak Technique to analyze historical global tropical cyclone (TC) intensities (Hennon, 2012). Cyclone Center’s primary goal is to resolve discrepancies in the recent global TC record arising principally from inconsistent development of tropical cyclone intensity data. The Cyclone Center technique standardizes the classification procedure by condensing the Dvorak Technique to a few simple questions that can be answered by global, nonprofessional users. One of the main advantages of this approach is the inclusion of thousands of users, instead of the 1-3 who would normally classify a TC image. This allows the computation of measures of uncertainty in addition to a mean intensity. Nearly 300,000 images, encompassing all global TCs that formed from 1978-2009, will be classified 30 times each – a feat that would take a dedicated team of twenty Dvorak-trained experts about 12 years to complete. Citizen scientists have already performed over 100,000 classifications since the project launch in September. Once the project is complete, a new dataset of global TC tracks and intensities will be made available to the community to contribute to our efforts to provide the best possible TC data record. Interested readers are encouraged to learn more about and participate in the project at the cyclonecenter.org website (there are some FAQ on the project blog). The CycloneCenter project is a collaboration between the Citizen Science Alliance, NOAA National Climatic Data Center (NCDC), University of North Carolina at Asheville, and the Cooperative Institute for Climate and Satellites (CICS) – North Carolina. I looked at the Cyclone Center site, and it seems very interesting. How much time would be involved in participating in this citizen science project? I didn’t find any indication on the Cyclone Center site. I have been involved in other citizen science projects, birding mostly, and the time commitment varied widely. Since this project is a work-at-home type of project, am I correct in assuming this is a work-at-your-own-pace type of project? Do the data that we do have show that Arctic cyclones are increasing in number? In intensity? Are they coming more frequently in the non-winter months than they used to? Are they different kinds of storms than used to happen there? Do we expect them to start forming more often and more intensely in the future? Along the ice edge? Along the GIS? If so, how might these development affect Arctic climate and ice formation, and the rate of GIS melt? Sorry for the barrage of questions. I’ll look further into linked sites. I’m excited by the idea of participating in this kind of research, but I’m a bit dubious about the skills of the likes of me to accurately assess a storm system. “analyst subjectivity inherent in the procedure” Not. 1 based on or influenced by personal feelings, tastes, or opinions : his views are highly subjective | there is always the danger of making a subjective judgment. Contrasted with objective . There is a lot of measurement error and there is some “human system bias” dependent on eyesight, tiredness, etcetera, but “subjectivity” is the wrong word. As used by everybody else, there is no subjectivity in these measurements. There are no endearing storms. There is no emotional attachment to any one storm. If there is, you know about it and you can delete that one. Thanks for explaining “Why We Disagree About Climate Change” by Mike Hulme, but I’m not buying it. Re #1 Joseph: the whole thing is set up so that it is work at your own pace. Any single set of images is a subset of six images from a randomly chosen storm. Each image takes a few minutes at absolute most. And you can classify 1 storm or hundreds of storms as your time and interests permit. Re #3 Edward: If you look at the iBTRACS website or the cyclonecenter blog post here you will see that there actually is a lot of subjectivity in the interpretation of the imagery for many storms – particularly outside the N. Atl where we are not afforded regular flight recon data. In the West Pacific there are multiple official forecasting centers and at a given time these have differed for some storms by upwards of 50 knots for the same imagery. If that is not indicative of a degree of subjectivity in interpretation of the imagery then I’m not sure what is. Subjective: 3 : A characteristic of, or belonging to, reality as perceived rather than as independent of mind. Objective: 1 b : A condition in the realm of sensible experience independent of individual thought and perceptible by all observers : having reality independent of the mind. 1. existing in the mind; belonging to the thinking subject rather than to the object of thought ( opposed to objective ). So the classification problem involves, at a minimum, the mapping of verbal descriptors (and, these days, usually, color photos, drawings and even video) onto a specimen which is never an exact match for the given criteria. And since the main tool for creating, modifying and communicating the criteria is language–not (usefully) reducible to complete precision–that mismatch is never going away, not while humans are doing the classification, at least. Wili, one of the nice things about this project is that you do not have to know anything about tropical cyclones to contribute. And you should not worry about being “wrong” or screwing things up. We want to know how different users vary in their assessments; that gives us valuable information! 4,6,7: Huge error bars on a number do not add up to subjectivity. Huge error bars are still objective, not subjective, because the error bars are still on a number. In the case of 50 or 65 knot error bars, the order of magnitude is still right, and that can be pretty good. You can easily tell that the wind wasn’t 2 or 3 knots, nor was it 1000 knots. A subjective report is one in which you can’t tell 2 knots from 1000 knots because there are no numbers at all. Does this matter? Yes. Which word you use has a practical result. A subjective report is no better than anybody’s opinion, no matter how ill informed. If the report is subjective, there is no reason for anybody to pay attention to it. The whole point of science is that science gets answers that are more truthful than any previous method’s answers. If science is subjective, then science is ignorable. If science is subjective, the babbling [word salad] of mental patients is just as informative as science. In principle at least, an objective report can be tested and improved upon. A subjective report depends on every person experiencing the same thing for him or her self. Example: Good or bad vacuum supply to vacuum powered windshield wipers. You may be too young to have heard of them. The experienced mechanic can test the vacuum by putting his thumb over the end of the hose. Without the experience, “good or bad vacuum” has no meaning. But if I say “about 1 psi lower than air pressure is good,” that has meaning no matter how little experience you have had at fixing vacuum powered wipers and regardless of the error bars. You know not to expect a hard vacuum like outer space, but to expect a mild pop sound when you remove your thumb from the end of the hose. Yep, beware … 100+ already. #9–Edward, IMO you have missed the entire point of what I wrote. I wasn’t talking about “huge error bars” but about how the knowledge is arrived at. I’d go on to vigorously debate your entire second paragraph–which I regard as consisting more or less completely of your subjective opinion!–were it not for the fact that that would open up yet another OT wormhole. This list could get very long. As the Tofflers say: “Science is different from all the other truth-test criteria. It is the only one that itself depends on rigorous testing.” They go on to say: “In the time of Galileo . . . the most effective method of discovery was itself discovered.” [Namely Science.] The Tofflers also say that: “The invention of scientific method was the gift to humanity of a new truth filter or test, a powerful meta-tool for probing the unknown and—it turned out—for spurring technological change and economic progress.” All of the difference in the way we live now compared to the way people lived and died 500 years ago is due to Science. The other truth filters have contributed misery, confusion, war, fanaticism, persecution, terrorism, inquisitions, suicide bombings, false imprisonments, obesity, diabetes and other atrocities. If science is subjective, then the industrial revolution never happened, we never went to the moon, airplanes don’t fly, cell phones don’t work, etcetera, etcetera, etcetera. If science is subjective, then RC has no claim to being any more truthful than WUWT and Global Warming really is a hoax. If science is subjective, then why are we reading RealClimate, why do we care about GW? If science is subjective, then there is no reason why the general public should pay any attention at all to what the climate scientists have to say. If science is subjective, then scientists are no better than any lunatic who prophesies the end of the world. Only if science is objective is there any reason to stop burning fossil fuels. Why doesn’t the general public force the issue of GW? The objective/subjective issue could be part of it. Clarify your own thinking before trying to convince others. I think that what you really mean is that reading scientific instruments is done by the same biological computers, human brains, that also make mostly subjective decisions. Since human brains were designed by evolution to survive, not to do science, science is difficult. So what? Electronic brains cannot read meters with zero error bars either. Scientists know how to handle error bars. Most people don’t. Organic brains vs electronic brains is irrelevant. Classifying the storms is actually fun–besides being a useful project. As Gavin pointed out Arctic cyclones are completely different beasts. You can find a 50 year record of “Northern Hemisphere Cyclone Locations and Characteristics from NCEP/NCAR Reanalysis Data” at NCEP/NCAR. Both Mark Serreze and Burghard Brummer have written extensively on Arctic cyclone activity. I am not a modeler but if I understand their projections in this area, within the next 30-50 years the models show general cyclonic activity slowly moving north & east with tracks tending towards Spitzbergen. I believe that the models show no significant increase in intensity or frequency. Some interesting climatological questions are, how, if at all, will this northward movement affect the meridional overturning process? Does the center of action of the Icelandic Low of the NAO move north as well? Surely the first question should be “what is the change in cyclone activity?”. sp #16. The first question Chris gave encompasses the question you ask. Its about changes in frequency, strength etc. through time. Your clicks tell us about all these things. Change has been common in the operational forecast centers over the 30 years for which we have satellite imagery. What we don’t know is what the effect of these changes are on the ‘official record’ which these operational analyses constitute (after year end re-evaluation as done e.g. at NHC right about now for the N. Atl.). Forecasters change over time. Guidance changes over time. What is the effect? The other very unique thing that a crowdsourced project can do is give some sense of uncertainty arising from the fact that this is an analysis of an image undertaken by the human eyes and mind. Which human eyes and mind probably has an impact on the resulting analysis. By getting multiple independent analyses of each image we can begin to discern this. Many hands make light work as the old proverb goes. Its of interest to address how much this uncertainty is and whether certain storms or portions of storms are more uncertain and why. You also never know what may be discovered along the way and whether it may actually serve to improve knowledge of TCs and hence future forecasts: both operational and climate projections. sp, if by “activity” you mean “intensity”, then yes, even today the recent record is uncertain. Recent studies of western North Pacific intensity trends contradict one another because they use different intensity data records from different forecast agencies. Of course the farther one goes back, especially before the age of microwave satellites, the more uncertain the record gets. If Cyclone Center can provide a homogeneous intensity record (to the extent that is possible with the Dvorak technique), that will be a good first step. On the topic of the main post, I’m glad to hear that this is such a fun and easy thing to do. I’m coming off of a particularly hectic period at work, so I should have some time to devote to it, now. Possibly more appropriate on the Unforced Variations thread, but I’m posting here because it bears on the discussion started at #3. And since we are in the holidays, and some folks may have a little more time to read than usual–just came across this article, which has to do with–I kid you only a little!–the Meaning Of Life. Those who tout science as the be-all and end-all of knowing fail to see that what is really dispiriting about this perspective is not the objective reality it reveals, but the subjective reality it occludes. When objectivity becomes paramount, the fact that science is just one of many authentic ways we have of getting to know the world, and one whose great technological potential ought to be wielded circumspectly, is discounted. It chimes ever-so-neatly with what I was arguing above, but you really must read the article to fairly consider the merits of the brief statement I excerpted. 21 & 22 Kevin McKinney: So Monod thinks that the fact that it was a subjective mind that invented science, science must be subjective. Monod was wrong. Science is the method that enables subjective minds to accomplish objective things. Richard Dawkins, Sam Harris, and Daniel Dennett do not echo Monod. If Monod was a nihilist, that was Monod’s own symptom of depression, no one else’s. There is no “profound epistemological contradiction.” Life is the meaning of life, and no other meaning is needed. Neither vitalism nor animism is needed. “the unwearying, heroic effort of mankind desperately denying its own contingency” is nonsense. The universe has no meaning. It just is. Be happy with ” Life is the meaning of life.” That is all you get. “What doubt can there be of the presence of the spirit within us?” See books by Raymond Kurzweil: “How To Make a Mind,” “The Age of Spiritual Machines” etc.. The biologists have already made viruses directly from chemicals and they are now working on making bacteria directly from chemicals. It will happen within 10 years. They are thinking about making humans with reverse chemical handedness. Book: “A Universe From Nothing; why there is something rather than nothing” by Lawrence M. Krauss, 2012. This book is about the creation of universe(s) from nothing with no outside help. Not in this book, we should be able to create a universe in about a century.